For two years we have heard a massive critique of the Trump white house as “unstable”, many media heads comparing a position in the Trump administration to being that of a revolving door. With the firing of numerous high profile individuals such as Rex Tillerson, the Secretary of State, pundits claimed that Trump was unstable and that the White House would be hamstrung due to inefficiencies. These fears and critiques were put to rest and even proved wrong however, this last Tuesday, when North Korean dictator Kim Jong Un signed a bilateral agreement towards peace. 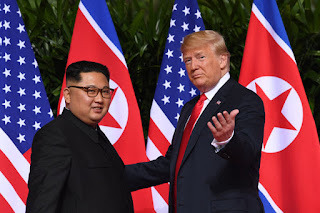 What the media fails to understand is that President Trump, through grandiose and bombastic statements, in conjunction with economic pressure placed on China, was able to officially end the Korean war, which has been in a state of Armistice since 1953. No credit will be given but Mr. Trump should be feeling high and mighty at this point in time. However, what does this mean for his election, or rather re-election chances? Well the economy is doing well. It’s doing really well actually. It’s doing so well that leftist political pundit Bill Maher wants a big recession to happen in order that President Trump not be re-elected. Let it be noted that Mr. Maher is worth millions of dollars and would not be affected by said recession he wishes upon the rest of us plebians. But the important part of what happened Tuesday is this. Trump’s executive populism works. Rex Tillerson was an Exxonmobil executive and a stale conservative. He is the swamp. His initial hiring for a position of such prominence when it comes to foreign policy was certainly a sore point for many Trump supporters. However, Trump did the thing Trump is known for and is best at. He fired him and took charge. He stopped listening to his advisers and started to take drastic action into his own hands and we have success because of it. Leftists will bemoan the fact that Trump didn’t achieve a full denuclearization agreement or that he did not address the human rights violations of North Korea but that’s just another example of critics of the president moving the goal post. He was able to sit down, face to face with the leader of North Korea and achieve some form of accord and agreement to continue working together in the future. This is something that hasn’t been achieved in 65 years and the critique that any administration prior to his could’ve done it is hamstrung by the fact that none of them did. In fact Barack Obama was offered a chance to do so when Dennis Rodman communicated Kim Jong Un’s desire to speak with the president and yet Rodman and Kim were both rebuffed by the foreign policy in retreat president. So why do I say that this could mean Trump’s reelection? As I said it proves that Trumpism works. It proves that Trump’s bombastic rhetoric towards a bully in conjunction with his shrewd economic prowess in comparison to our other presidents worked. By putting economic pressure on China we were able to bring North Korea to the table with a position of strength that hasn’t been possible before. Everybody critiqued every single one of president Trump’s policies and denounced him as a lunatic. When he passed our tariffs on China numerous people screeched about negative effects on our economy. Within a week Kim Jong Un was summoned to China to have a conversation with the Chinese government. When Trump started using our military power to back up his bombastic responses to North Korean jingoism, it was Kim Jong Un who backed down and Guam remained untouched. Trump might possibly be the new Bismarck, with his fluency in RealPolitik and recognition of an economy’s importance to foreign policy. I can only hope that president Trump will rewrite the Iran deal as shrewdly and cunningly as to undercut the failings of the former administration. It’s just a shame that Mr. Trump inherited such a foreign policy mess but he’s quickly proving to be apt at cleaning it all up. Considering that Mr Trump ran on fixing the mistakes of president’s past and how he has deviated so far from the establishment line one has to say that he is succeeding and keeping these promises are vital to mobilizing the same base that elected him the last time and even turning some new voters.